The Syrian Army published a video of it firing the TOS-1A Solntsepyok thermobaric rocket launchers and Grad multiple rocket launchers against Islamic State (ISIL) positions in the mountains in the north-east of Latakia. The Solntsepyok (which in Russian means the "Blazing Sun") is a multiple rocket launcher and a thermobaric weapon designed to defeat enemy personnel in fortification, in open country and in lightly armored vehicles. Its thermobaric projectiles are especially effective in mountain areas as their blast waves resonate and are boosted in confined environments. They have an effective range of nearly three-four kilometers as the rocket has a massive payload and a compact engine unlike conventional projectiles. The Solntsepyok explosive consists of explosive aerosol which is spread above the target and ignited. It creates a longer and more sustainable blast wave than conventional condensed explosives. In the epicenter of the explosion, the temperature rises to 1,000 degrees Celsius. More so, the explosion burns out atmospheric oxygen, and the subsequent vacuum ruptures the lungs of the victims. The TOS-1A Solntsepyok is an upgraded version of the TOS-1 Buratino heavy flame-throwing system which underwent its first combat tests in Afghanistan in 1988-1989. 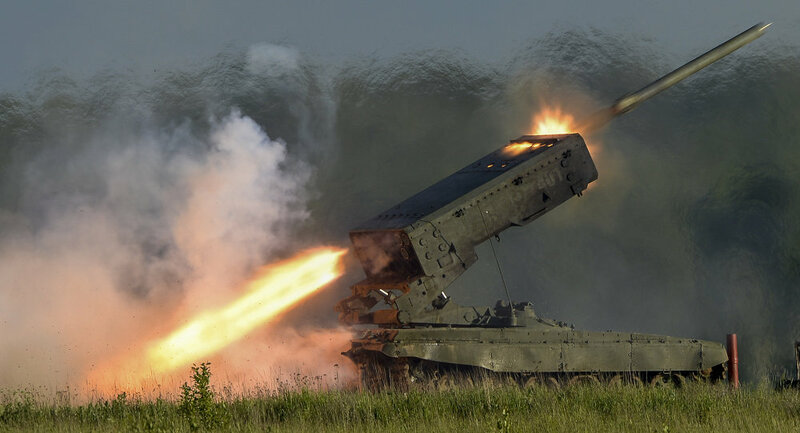 "Russian-made heavy flame-throwing systems are quite popular in the Middle East. Their use in Iraq proved that the TOS-1A is perfect for local combat operations to defeat enemy personnel in heavy fortifications," Igor Sevastyanov, head of the Rosoboronexport delegation, said during the Russia Arms Expo 2015.